Putnam General Hospital: News - The Medical Center, Navicent Health Becomes Georgia�s Only Nationally Verified Level I Trauma Center. MACON, GA (Monday, November 14, 2016) - The Medical Center, Navicent Health (MCNH) is pleased to announce it has achieved verification as an American College of Surgeons (ACS) verified Level I trauma center. MCNH has been designated a Level I Trauma Center by the State of Georgia since 1998, and has now become the only Level I trauma center in the state and only one of 11 hospitals in the Southeast to achieve this additional, national recognition. "The trauma team at The Medical Center, Navicent Health voluntarily sought verification from the American College of Surgeons, for the benefit of our patients and their loved ones. We have gone beyond the standard requirements for Level I trauma centers to exceed the highest standards set forth by this national certification body. At The Medical Center, Navicent Health, our trauma team seeks to be the best and to obtain the highest level of achievement," said Dennis W. Ashley, MD, Director of Trauma and Critical Care for MCNH. ACS is a scientific and educational association of surgeons that was founded in 1913 to improve the quality of care for the surgical patient by setting high standards for surgical education and practice. ACS is dedicated to improving the care of the surgical patient and to safeguarding standards of care in an optimal and ethical practice environment. As an ACS-verified trauma center, MCNH becomes the only Level I trauma center in the state to receive this verification and one of 112 ACS-verified Level I trauma centers in the United States. "As the only Level I Trauma Center serving central Georgia, patients who rely on The Medical Center, Navicent Health for care receive the most comprehensive and all-inclusive care for their injuries. Now, as a nationally-recognized ACS Level I trauma center, our patients can trust that we are exceeding the standards in order to provide the highest levels of care," said Ninfa M. Saunders, DHA, President and CEO of Navicent Health. Of 185 hospitals in Georgia, only 22 are trauma centers. The state of Georgia classifies trauma centers on a scale of Levels I-IV, dependent on the level of care provided. Only six hospitals in the state - including MCNH - are classified at the most comprehensive level, Level I.
MCNH's Level I trauma team, comprised of numerous surgeons in various specialties as well as highly-trained and specialized clinicians, is available 24 hours per day and able to provide the most sophisticated level of care for trauma patients. In addition, as a Level I trauma center, MCNH leads the field in research and provides training for future surgeons through residency and fellowship programs. Level II trauma centers, while providing many of the same specialties as Level I trauma centers, do not participate in research or education. Level III trauma centers provide basic trauma care but do not employ the surgical specialists needed for more complex cases. The more complex patients are typically transferred to hospitals providing higher levels of care, including Level I trauma centers. Level IV trauma centers are primarily located in rural or critical access areas, where patients receive initial resuscitation and stabilization before they are transferred to a center providing a higher level of care. "Across the nation, Level I trauma centers are typically in large, metropolitan areas. 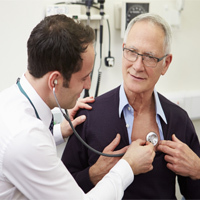 The availability of care provided at The Medical Center, Navicent Health is very rare in smaller communities like Macon. Patients in central and south Georgia are incredibly fortunate to have access to the Level I trauma services, now nationally verified by the American College of Surgeons, so close at hand when accidents and injuries occur," said Chris Hendry, MD, Chief Medical Officer for MCNH. Navicent Health was incorporated on November 17, 1994, as a nonprofit corporation whose primary purpose is to coordinate the Medical Center, Navicent Health and other affiliated entities in their mission of providing a comprehensive continuum of high quality, reasonably priced healthcare services to the region. Navicent Health has 830 beds for medical, surgical, rehabilitation and hospice purposes. 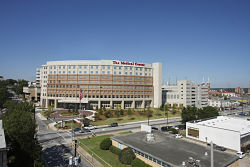 The health system includes The Medical Center, Navicent Health, a nationally recognized tertiary teaching hospital; Children's Hospital, Navicent Health, the region's only dedicated pediatric hospital; Medical Center of Peach County, Navicent Health, a rural critical access hospital; Rehabilitation Hospital, Navicent Health, the region's oldest and most experienced rehabilitation provider; Pine Pointe, Navicent Health, which provides palliative and hospice care in homes and in its facility; Carlyle Place, Navicent Health, the area's first continuing care retirement community; Navicent Health Foundation, the philanthropic arm of Navicent Health; as well as diagnostic and home care services. For more information, please visit www.navicenthealth.org.